The odd thing is that I really can't believe I'm only twenty-eight. I realise I haven't achieved very much - anything - with my life so far. Meanwhile, I do lose a lot of time to ill health, days and weeks just slip. But overall, I have had such a full and interesting life that I can't believe I'm still in my twenties. Don't ask me how old I imagine I should be, but twenty-eight years sounds like much less time than I've had so far. I think I should record this in case anything happens to me and people think I had no time at all or a bit of a rubbish time. It is a bit rubbish sometimes, very rubbish on occasion, but mostly it is very very good. This week, for example, is several times better than the last. On Monday, we met Jess and her chap, which was lovely - they came all the way from Pittsburgh to have lunch with us. Well, kind of. Today we are off to my folks' for Christmas. I might even get Birthday cake! This week I have fainted often, fallen down even more often, but nevertheless managed to get all my Christmas cards in the post (well, [...] put them in the post, but I did my thing). I have not been suffering terribly; I was far more miserable last week when I was going down hill. At the bottom of the hill, strategy is always much clearer. Even if not much else is. Like how long you've been lying on the kitchen floor and what were you doing before you got there. Now I am picking up, although I am still wandering about with the strong sense that I'm about to pass out and/or fall down at any moment. Bathing is still a little scary, as you might imagine. And my heart is falling out of rhythm rather too often. I think my rock'n'roll lifestyle may be catching up with me. We finished the one Christmas present we have managed to make this year (I had planned to make others, they all fell off the list). It is a puzzle for Alex. It was [...]'s idea; the snake's stripes come out and you have to put them back in the right order. [...] did most of the cutting and I did most of the painting. I realise there's no indication of scale here, it is enormous - about 16" wide. Having come to terms with what I'm not going to achieve before Christmas, I am now looking forward to it. It's coming on Christmas and I've done almost nothing. For some reason, this is making me terribly and stupidly anxious. At least something is making me anxious. And this anxiety is getting on my nerves, since I really have nothing to worry about. It has been a bad brain week though. And I've had the usual niggle as to whether I can't write or paint because I'm just knackered or because I am lacking motivation, or at least in the wrong frame of mind. This is the great problem with fatigue and anything creative; if it was just sums, I could either make myself do them or I couldn't, whether I wanted to or not. Whereas people in perfect physical and mental health have creative blocks. Trouble is, as soon as I ask myself whether my frame of mind is part of the problem, I begin to feel guilty and miserable. And being rather miserable, I have even more reason to suspect that it isn't just fatigue. Which makes me feel more guilty and miserable. And anxious. That and the Christmas thing. I was going to make cards and I realise that my cards are going to be crap, consisting of a great deal of glitter and not much else. If I actually finish them. Oh who cares? Do you care? It took me all of today to write this. And that pisses me off. Also, I realise that I was doing great last week, but feel like I haven't done one productive thing in months. And that pisses me off. My ingratitude! I am by far the most irritating person I have ever met. 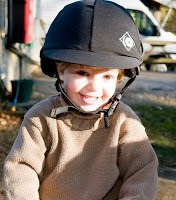 At the weekend, Alexander got to ride a real horse for the first time. For some reason, the pony in question had attempted to disguise itself as a Christmas tree. I wasn't there but I thought I should share a couple of the pictures with you. And it is a milestone. Alex has previously only ridden his rocking-horse, which is about the same size. I guess riding a horse is on one of those lists like "50 things to do before you're 3". Apparently, Alexander is a natural. 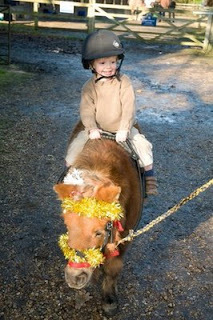 I guess he'd have to be, what with being two years old and managing to sit on the horse without support. They even managed to trot. I am afraid I have unpopular thoughts about the Credit Crunch. Well, the crunchiness may have passed; the BBC News website renamed the crisis a Downturn and even had a snazzy logo to accompany related stories (although they appear to have abandoned this). Meanwhile, back in October, Radio 4 had a season of programmes about the Credit Crash. Generally a crunch comes just after a crash. For example, if you fell against a stack of cereal boxes in the supermarket, it would kind of go crash and then crunch in quick succession. Which is rather melodramatic coming from someone who takes no more than three minutes to earn such a princely sum*. But all this has got me thinking about our ridiculous attitude towards money – an attitude which caused this problem in the first place and is going to make it all the more painful. Yeah, it's that kind of monster of a post, but if you make it to the bottom, you can have a picture of a terrapin! The trouble is that we believe that money should be fair. It can't be. Money is just numbers. In this economy, these numbers are regulated by almost entirely by supply and demand (capitalism). Supply and demand are not fair. Something you are going to sell to someone else – whether it is a thing or some work you can do – is only ever worth what somebody else is prepared to pay for it. Whilst hard work, skills, talent, intelligence, charm and cunning may increase the price you are paid, your control over the matter is very limited. If you are a brilliant footballer who gets all the right breaks, then you can make millions of pounds and compare your working conditions to slavery. But most people who are brilliant at football never get to play for money. If you are a brilliant car mechanic or a fantastic florist, then there is a fairly modest upper limit on how much money you can make. This blog is not worth any money, and yet is infinitely more valuable than the work of certain newspaper collumnists who get paid a small fortune. Much fewer people read here, but much more charming, more discerning and generally better-looking people, which is a far more valuable reward. A person cannot work themselves rich. Some people are smart, skilled and/ or work very very hard and accumulate massive wealth, but only if what they have to supply happens to meet a demand – that is, they get lucky. Most rich people were born rich. Meanwhile, most talented, hard-working, brilliant people are on average incomes, at risk of hardship should they fall upon bad luck such as unemployment or ill health. And thus a proportion of the most talented, hard-working and brilliant people are relatively poor. But capitalism is not a bad thing. Financial inequity is not the same as social inequality. In order to make sure of this, we have things like a minimum wage, universal healthcare, education and the welfare state. We have certain controls on financial activity and the amount of social and political power that money can buy. And fortunately, once you don't have to worry about a roof over your head, having enough to eat and a little to spare, money doesn't make a great deal of difference to one's happiness. Work (renumerative or otherwise) has its own rewards. And our value as human beings has absolutely nothing to do with the money in our pockets. The trouble is that most people don't believe this. Not truly. Our particular cultural work-ethic is highly individualistic, based on personal economic reward. A good job is first and foremost a well-paid job. People have some choice about the work they do and some make altruistic choices, but principly, the purpose of work in our culture to provide for oneself or one's immediate family, for one's own independence, security and happiness. These things, we are told can be bought – a principle we have reiterated several times a day. Everything is for sale; in any given ad-break we are sold sexual attractiveness, physical wellbeing, a happy family and the envy of our peers, all in the form of yoghurt or soap powder. And this has ruined our economy. The first effect is (or at least was) hubris in the face of short-term prosperity. During the boom, those who were doing well thought they'd earnt it. Home-oweners spoke about the artificial rise in house-prices as if this was something they had achieved through hard work – and something for keeps, which of course it wasn't. Meanwhile, in the City, people were making money in all manner of strange and inventive ways and oh, how very well they were rewarded! If you believe that your wealth is a product of natural justice, then it is difficult to conceive of it ever going away. I am not going to work any less hard in the future, so I shall always be this wealthy. In the context of reduced financial regulation and a sustained economic boom (so sustained that many young city types had never known any different), this got completely out of hand. The second effect is that most ordinary people, most of the time, don't actually perceive that they are doing well at all. Most people you speak to will complain that they are either underpaid, or that they might have enough coming in but they pay too much tax. This is not greed. Surrounded by messages which say that the accumulation of stuff is the reward for virtue and the thing that's going to make you happy, respectable, secure and so on, you're bound to feel short-changed. You're smart and you work very hard, so why shouldn't you have all the shiny things you want – shiny things that far less smart, less hard-working people seem to have? In this culture people who have no problem paying for essentials nevertheless become very frustrated with financial limitations. One friend recently complained that there is no state help for people like her, because benefits and tax-credits are means-tested according to your income and don't take into account how much money you have going out. Yeah, I know. And yet I sympathise; she works very hard, and only wants decent things. A decent house in a decent area, a decent car, decent holidays, decent technology. Since this standard of living is a struggle, she feels like she's going without. Add cheap credit into the equation, and an enormous personal debt problem results. I don't work or own property, and yet even I was receiving offers of thousands of pounds in loans. Treat yourself, the literature said, give yourself the break that you deserve. Now, I don't believe that people need protecting from themselves, ought not to be loaned money or subjected to advertising. I think people who have borrowed beyond their means for non-emergency purposes are responsible for their choices. Not that they need berating; it'll be tough enough as it is just now and anyway, some degree of luck is always involved. Some first-time buyers got 125% mortages – which seems ludicrous - but others in their peer group got help from Mummy and Daddy and hardly took on any burden at all. However, we are all free to reject this culture. For our own sake, for the sake of an economy which impacts on everyone, and for the sake of the environment. Money is not moral. The consequences of our attitude towards it are. This enormous terrapin and its similarly proportioned friends live at the school where Alexander goes to nursery. Previously, I'd only seen terrapins the size of small apple (though not quite that shape); these were the size of a melon (though not quite that shape). And no, I don't have any pictures of kittens - the terrapin will have to do. * In fairness, I was buying kitchen roll in Poundstretcher, conscious that I was paying 0.4p a sheet – closer to 0.3p with the special offer, as opposed to 0.5p a sheet in Wilkinsons and a shocking 0.7p a sheet in Tesco. In case you wondered (I'm pretty sure you didn't), if you take absorbency into account, Wilkinsons is the best value – it is about the same quality as Tesco, whereas the Poundstretcher stuff is very thin. I hope this confession mitigates for any degree of sanctimony above... and it takes two minutes and four seconds to earn 19p on the UK minimum wage – a few seconds longer after tax. ** Meanwhile, we participate in the exploitation of the poor in other countries and use more than our fair share of the planet's resources because we don't really believe that the world could be as extraordinarily unfair as it is – but that's another subject. Granny and I decorated this year's Christmas cake last week - well, we started last week, but I fell asleep and had to finish it off at home this week. It's quite pretty, only it's not everso Christmassy (not nearly so Christmassy as last year's effort), and those white flowers are supposed to be hellebores (Christmas Roses). Unfortunately, they look rather more like lillies. Perhaps they are Christmas Lillies. Still, I think we did pretty well considering the lack of time. And the bit I sawed off in order to make the top flat was scrumdiddly. There's enough brandy in that there innocent-looking cake to make an elephant dance the Macarena. Sixty-something years ago, a group of bright young minds, including the great Alan Turing went to Bletchley, to perform complex mathematical equations in order to crack Nazi military codes and eventually defeat the forces of tyranny. It was perhaps an ill-fitting tribute that this weekend, [...] and I went to the Ikea in Bletchley, to perform complex mathematical equations in order to buy a new kitchen, taking the 2.5% reduction in VAT into account. We certainly overcame tremendous odds, such as lack of sleep, van-no-brum-brum and cold heavy rain which meant that, once we got going, we had to drive all the way there with the windows open so that the windscreen didn't steam up. And the Sat-Nav which didn't know that Milton Keynes existed (perhaps she just hates going to Ikea). Since it was so far to travel (for us) and we had so much to do, we planned to stay overnight in Milton Keynes. On a Sunday night, if you book in advance, you can get a room – including complimentary teabag – for £30. It was by happy coincidence that the new VAT rates came in on Monday, so we were able to save our landlady about £30 on the kitchen. So our stopover paid for itself in a roundabout way (there are a lot of roundabouts in Milton Keynes). Staying in a hotel is still a terribly exciting thing for me which I get to do about once every three or four years. I think hotels are terribly exciting places where all sorts of weird and wonderful things go on in close proximity. I could barely sleep for thinking about all the illicit affairs, murders and mafia dealings taking place in the rooms around us. We bought new plates and bowls! Since I break everything I touch, we've been needing some more for ages - if anyone came round to eat, we had to take it in turns. And they are very nice, as plates and bowls go. Cobalt blue,Ｉguess you'd call them. For the first time ever, I was able to go round Ikea under my own steam (uh, it's a very old-fashioned coal-fired wheelchair). It was much better. I could look at all the things I wanted without having to give directions or answer the question, “What do you want to look at that for?” and I could fondle the soft-furnishings to my heart's delight. I could also participate in the warehouse bit – every other time I've been, I've had to be parked somewhere and sit like a lemon for half an hour. Then there's always been this difficulty of how to get both myself and a trolley of stuff out through the checkout. But as my powerchair goes pretty fast, I could go and collect things for [...] and he could be the lemon. I did have to stand up on tip-toes for some of them, but I waited until nobody was looking. I almost ran over a hedgehog! It was a cuddly hedgehog, but it still would have gone squish. Fortunately I stopped just in time and was able to return it safely to the little girl who had dropped it. I managed to resist the temptation of a great number of toys I might have bought for Alexander, thus maintaining my record; two and a half years of auntihood and I haven't bought him any toys (although I've made him lots). It took some effort though; they had plush woodlice! It was such a busy couple of days that on Monday night I was wound up like a spring and couldn't sleep. So I watched an episode of Spooks (daft spy thing) on BBC iPlayer. I then dreamt about espionage being conducted in Ikea; secret codes written on those shopping-lists, spies hiding in the wardrobes, the boxes in the warehouse really having missiles in them. Yesterday I could sleep and did a great deal. I attempted to wash up and woke up with my head in the sink, still clutching the sponge. Coincidentally, Mary went to Ikea this weekend (although a different one - otherwise we might have met unexpectedly and ripped a hole in the space-time continuum) and Sara lost her Ikea virginity last month.